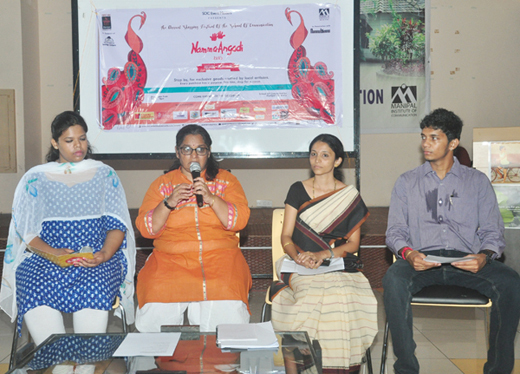 Udupi, Mar 16, 2015 : Festive Carnival atmosphere was visible at the three-day ‘Namma Angadi’, exhibition and sale of handicrafts, handloom and eco-friendly products, which began at the School of Communication (SOC) . The best artisans and craftsman from rural Coastal Karnataka was on display at the exhibition. Products were displayed in the open air auditorium and five classrooms of the SOC. Lamps, incense stands, plates and vases made of terracotta, earthen pots, bell metal products, clay jewellery, stone soap trays and decorative items made of eco-friendly materials, were exhibited. Cotton garments for men, women and children, palm jaggery, pure wild honey, baskets and trays made out of bamboo, lavanche products, natural fertilizers, kokum nectar squash, pineapple ginger jam, hot sweet lemon pickle, hot sweet pickles and a lot more was displayed. A large number of people not just from Udupi and Manipal, but also Mangaluru, visited the exhibition on the very first day. A lady from Mangaluru, said she was impressed by the items on display. She said that she was there for the first time and was glad she came and felt like carrying away many items. Another who was visiting for the first time too was keen to purchase clay pots and terracotta items and more. Students, who are organising the event for Working Children, were making every effort to make every visitors comfortable and encouraging them to purchase the products. They were also conscious of the social impact of the event. A student said, “We do not do this for grades, but because it motivates more to feel socially responsible.” All present said that it was good to give opportunities to rural artisans to market their products and display their skills. They work hard and sincerely to provide good healthy items, our support will help them make their lives better.